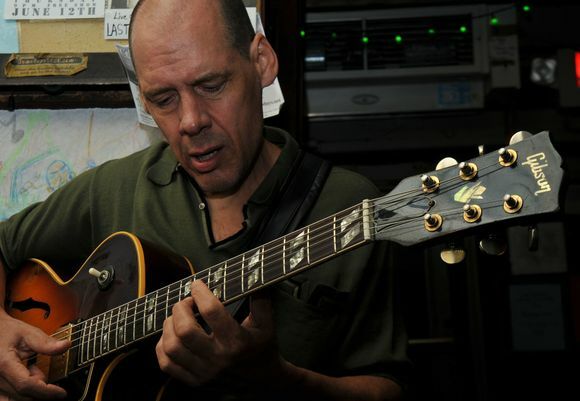 A jazz guitarist who found his style during the late 1970s, Mark Ackerman developed a connection with the sounds of an earlier musical era, identifying with the swing and post bop recordings of Charlie Christian and Wes Montgomery. Extended New York City engagements with Jimmy Lovelace, Frank Gant and Vernel Fournier in the 1980s gave him the opportunity to perform with some of New Yorks finest straight-ahead drummers. Leading a quartet that appeared in clubs and concerts during the 90s, he has performed with a veritable whos who of New York jazz. His recent appearances at the Ear Inn on Spring Street include dates with a quartet featuring the saxophonist Ralph Lalama and drummer Jimmy Wormworth, and have been a mainstay of the after-hours jazz scene for years now.